There will be another lucky person on the planet with an Aunt Paris Hilton as Nicky Hilton Rothschild is pregnant again! Heiress and fashion designer Nicky Hilton Rothschild is pregnant with her first child! Find out what a reliable source said about the exciting news. 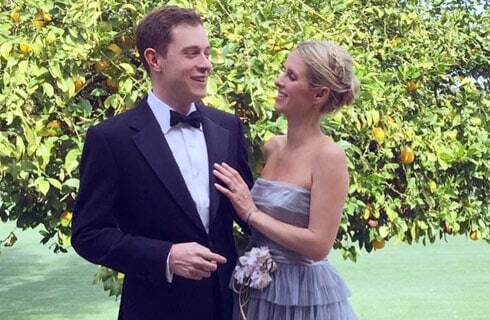 Nicky Hilton is now Mrs. James Rothschild. Earlier today, the pair wed in a fairytale ceremony at Kensington Palace in London. The bride wore a stunning Valentino gown complete with a lace overlay, high neckline, and long sleeves. Read on to find which celebrity friends were in attendance. 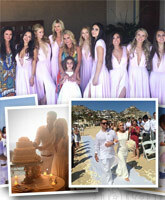 The Real Housewives of Beverly Hills star Kim Richards' daughter Brooke Wiederhorn got the dream Mexico wedding ceremony she's always wanted in Cabo San Lucas over the weekend. Keep reading to see tons of coverage from the beautiful ceremony, including a video of proud mom Kim's toast! There's also a heartfelt message from Brooke's dad, Monty Brinson, who was unable to make the trip because of his cancer diagnosis. Friday was National Siblings Day as well as the first day of Coachella 2015, so what better way to celebrate both than with two pairs of superstar siblings and Coachella bellas? Keep reading to check out the Hilton and Jenner sisters in their on fleek Coachella fashion and let us know which pair you think should take home Best In Show at the National Siblings Day Coachella Music Festival Fashion Show!